Today’s “continental” breakfast was considerably better than the previous day’s fare. It was self-serve, but they had eggs, smokies, toast, doughnuts, English muffins, cereal, and even a make your own waffles station. It was excellent. 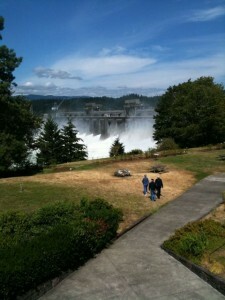 We left the hotel at 7:00 to drive to the Columbia River Gorge area. To see the falls during the early part of the drive, you have to get off highway 84 and onto 30, which is the historic highway. 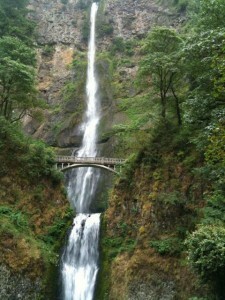 We stopped first at Multnomah Falls. This was a good first stop, because it is the most popular waterfall on the route, and very few people were there yet. By the time we left, there were a lot more people there. Luckily, it has been pretty overcast, so Stephen didn’t have to contend with partially lit falls. We only walked up to the bridge in front of the falls, and didn’t bother trying to hike up to the top. On the way to Wahclella Falls, we passed Horsetail Falls and since it was right next to the road, we stopped there briefly for some pictures before heading on. At the trailhead for Wahclella Falls, we had to pay for a $5 day pass. This was one of my favorite hikes of our trip thus far, partially because it gave me an idea for a short story about a mountain lion attack. When we got to the beautiful falls, Stephen began taking pictures and I worked on my short story. Once I finish it, I’ll post it on my other blog, Kara’s Reliquary. This was a pretty easy hike, about two round trip. There is a fair amount of uphill, but it’s all gradual. 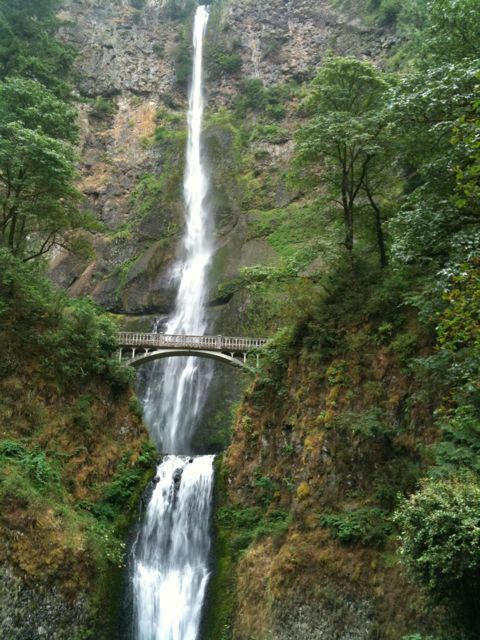 We went back to Multnomah Falls and ate lunch at their restaurant there, which was pretty good (and also not cheap) for a tourist attraction. I had the fish and chips, and Stephen had black bean soup with a small loaf of honey wheat bread. The bill was $28, which was a little pricey for lunch, but considering how little we’ve eaten out, I didn’t feel too bad about it. 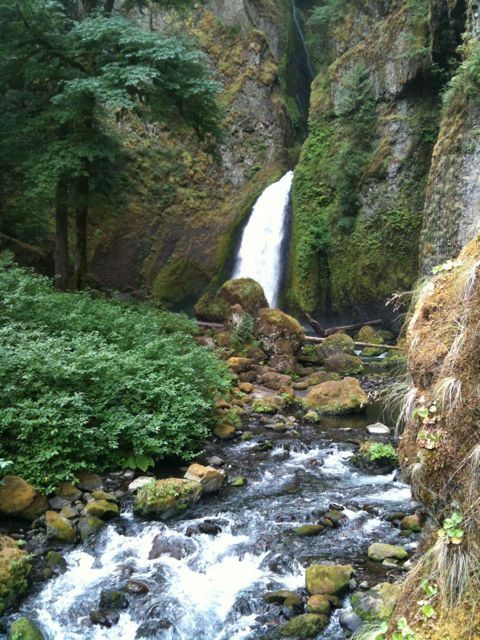 I picked the next falls, also around a two mile round trip hike, from Stephen’s Photographing Oregon book. Ellowah Falls looked more beautiful in the book. It would probably be prettier in the spring, when the water flow is heavier and there is more moss on the trees and rocks. 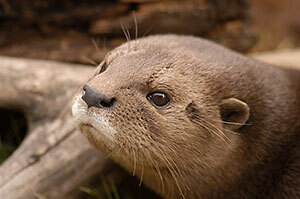 Nonetheless, Stephen did get some nice pictures. More so than the state park trails we have been on, most of the Columbia Gorge area trails seem to allow leashed dogs. We met a beautiful yellow lab puppy on this trail, who was way better behaved than our six year old dog. 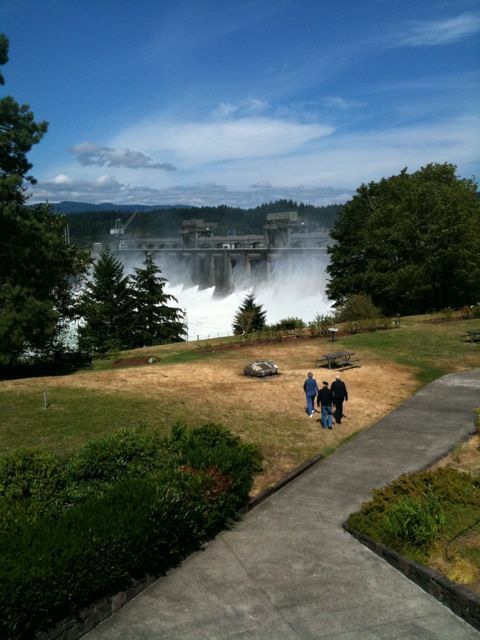 We went next to Bonneville Dam. It wasn’t nearly as impressive as the Hoover Dam, bit it gave us a nice break and I was able to get a good, rather surreal photo of some people walking toward the dam. One kind of neat thing they have there are some underwater windows where you can watch the fish swimming past. The water is a little murky, but we did see quite a few steelheads swimming past. We had just missed the big migration of sockeye salmon in July. By this time, it was around 2:00 pm and we had quite a bit of time before needing to get set up for late afternoon/sunset photos, and we didn’t have anything else on the agenda. 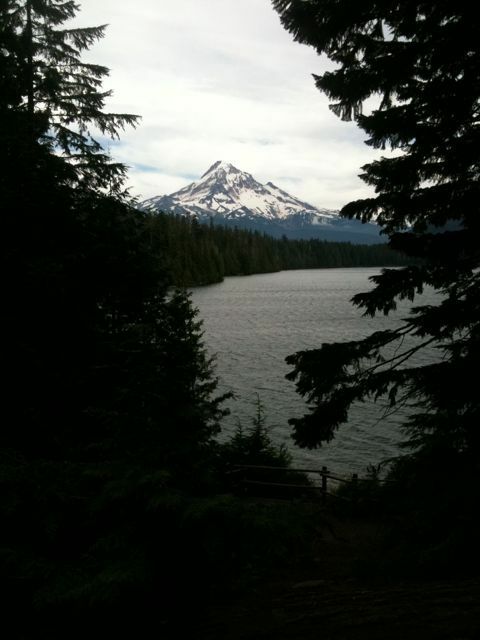 So we paged through the Photographing Oregon book and found a nice viewpoint of Lake Hood from Lost Lake, which was about an hour’s drive from where we were, so we headed that way. For these shots, a blue sky would have been better, but it was still quite overcast. From what the book said, we knew we wouldn’t need to be there long, and we headed back to the Columbia River Gorge In less than a half hour. We drove back to nearly the beginning of the Columbia River Gorge drive and went to Women’s Forum Park. It had a great view of Crown Point, but there was a large yellow van parked in front of the building there, which kind of ruined the picture. I suggested that we come back after Stephen got his other shots, assuming the van left during that time. Our next stop was Crown Point and Stephen took quite a few pictures there. During that time, the van left, but we had one more stop to make first. Latourell Falls was right next to the road, so Stephen was able to jump out and get quite a few pictures quickly. We went back to Women’s Forum Park, but unfortunately, although the yellow van was gone, the light wasn’t that great anymore for pictures. We were definitely ready to head back to the hotel room. When we got there, Stephen made roast beef hash, rice and corn for dinner. Then we watched tv a bit before going to bed. Wow, Kara, your trip looks beautiful!